As you may know already, Motorola is working hard on updating the G5 line, despite the fact that its two members were only unveiled this February. Still, things move fast in the mobile world, and the Lenovo-owned company wants to bring dual rear cameras to the G series as soon as possible. Hence, the Moto G5S and G5S Plus were born – and both should become official pretty soon, judging by the number of leaks we’ve seen about them recently. 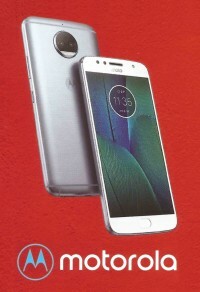 Today a new image has leaked showing the bigger model in the upcoming duo, the G5S Plus. What you see below definitely looks like a promo shot that will be used by Motorola once it announces the device. The renders are unfortunately quite blurry, but do click on the thumbnail below to get the full picture. Still, it’s not like we haven’t seen the Moto G5S Plus before. Just a few days ago some hands-on shots were outed, and another official press render leaked towards the beginning of the month. The Moto G5S Plus is expected to come with the Snapdragon 626 chipset at the helm, 4GB of RAM, 64GB of storage, and a 3,072 mAh battery according to the source of today’s leaked image. The cameras on the back will both have 12.9 MP resolution, one sensor being full color with f/1.7 aperture, the other black and white with f/2.0 aperture. For selfies you get an 8 MP f/2.0 unit with a LED flash. The phone will run Android 7.1.1 Nougat. Past rumors said the handset’s display would be a 5.5-inch one with 1080p resolution. Motorola is holding an event on July 25, and we’re hoping that the G5S Plus will be introduced on that occasion, alongside the G5S.